I am trying to make a commitment to do better dust collection in the new shop. I want to prevent the thick layer of sawdust the was on everything in my last shop, and I want to keep my lungs healthy for another half century or so. I have a few projects coming up that are aimed at those goals. The first being a shop vacuum cart. I have used a small shop vac for specific applications, but never had a general one to use at different places around the shop. My portable sanders, router, miter saw, and other dust generating tools often went un-vacuumed. I picked out a decent sized vacuum that had good specs but wasn’t the highest end you could get. It seems like for another 100 bucks you got a few features and a marginal increase in performance. The next level above that would go to the pro-sumer version at 5x the price. Not gonna happen on my current budget. I took some of the old counter top material left over from the previous owner and routed a nice radius on the front. I picked up the milescraft circle cutting jig for an upcoming project, but decided to give it a test run here. What a great jig! Well worth 40 bucks. There is going to be a 5 gallon bucket pre-separator before the main vacuum. I screwed a bucket to the base to hold the separator bucket and built up a platform to get the shop vac higher. I did a lot of positioning and found that moving the bucket to the right side and rotating the vacuum to the left let the inlet hose clear more easily. I screwed the shop vac down through the base into the platform. Hopefully these screws don’t rip out. If they do I will lose a lot of vacuum pressure. I got a dust deputy brand cyclone separator. It is supposed to spin the dust out to remove most of it before it gets to your filter. The hose port situation is a little awkward. The port up top goes to the shop vac. Even with elevating the vacuum it is an odd stretch. The hose wants to kink in on itself. I took kind of a step back and had a think. This calls for some 3D printing. The top of the dust deputy has a tapered shape to it. I printed a matching ring that fits into a 2″ PVC elbow. The printed part got epoxied into the elbow and fits on the top of the dust deputy. The friction fit holds it well and makes a good seal, but lets it be removable. With the elbow taken care of I created another fitting to push onto the end of the corrugated vacuum hose. This one works a bit like the fitting that comes with the vacuum. It slips over the outside and locks into the ridges. They are a 1/4″ pitch. I made a fitting with ramped one way rings inside. It pushes on easily, but is tough to remove. That should form a decent seal as well. I might bond this part in eventually, but for now, the hose can be removed, and so can the elbow. It makes taking the bucket lid off and dumping the dust easier. All assembled, I wanted to perform a test. I dumped out the main vacuum body and the removable bucket. I then went around and vacuumed a section of the shop floor around my miter saw and where I had been working on this project. I came up with a few cups of dust, a bunch of leaves and some chunks of stuff. The vacuum chamber was basically empty. This is great news. Now I can easily empty the smaller bucket instead of the big vacuum. Instead of running a standard pleated filter I can use a bag. The bags get disposed of, but have a finer filtration level. With 99% of the junk getting caught in the vortex, the bags will last a long time. Plus, anything that might puncture a bag will get filtered out. I have been using this a lot with my router for a really big dust job and everything has been working wonderfully. If you are thinking about adding a dust deputy to your shop vac, do it! I have gotten some good use out of my router radius templates. I saw an interchangeable jig system that did a similar job and included chamfers in addition to the radii. First a reminder of how they work. You sit the template on top of the wood and use a special router bit that is a cutter with a matched diameter bearing on top. The bearing follows the template and removes any wood that protrudes beyond it. 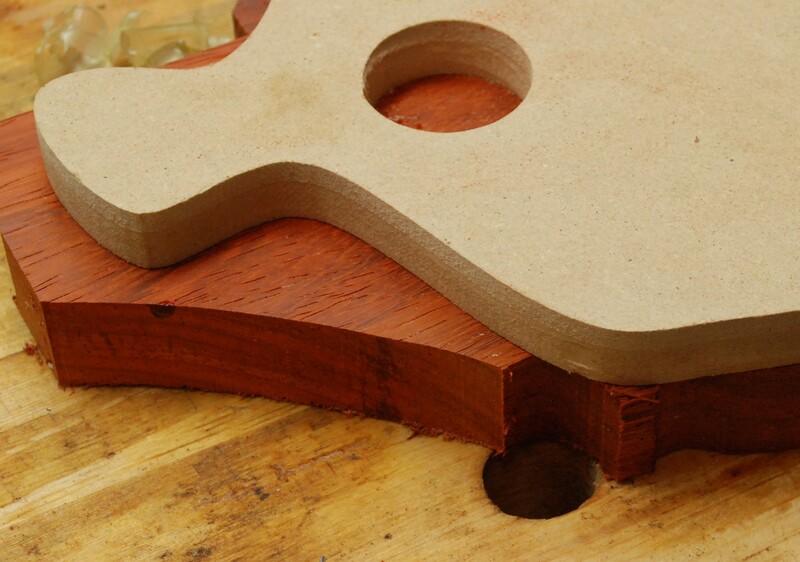 Ideally you cut off as much waste as you can on the bandsaw or elsewhere. Routers don’t remove a lot of material well. I modeled a variety of them from 0.5″ to 1.25″. The length given is a leg of the isosceles triangle that will get removed, not the hypotenuse. See the diagram below. I printed a stack of them in case the need arises, and uploaded the design to thingiverse. If they look odd compared to my normal prints, it is because I used some cheap translucent filament I had lying around. I figure they will get torn up eventually, so no need to use the good stuff. I recently bought an iPad for use during travel and for things around the house. One such thing is for use as a recipe holder while I cook. I have slowly been collecting my various scraps of paper and bookmarks into an organized google drive collection. Most fit nicely on a single page in portrait mode. I needed a way to prop it upright and started with a nice swoopy 3D printed part. I liked the shape, but it was a little too light and the color clashed with my kitchen. Unusual for me, I built a test piece first. Typically I just launch into this sort of thing head first and start making mistakes. The pine shape was made using the green 3D print as a tracing template. I liked how it came out and proceeded with maple. As I was cutting the groove on my router I made a huge mistake. I wanted to rout the groove a little wider, and moved the fence closer to the bit to make a second pass. CHOMP! I forgot, when I moved the fence closer I used the wrong side of the bit. When pinched between the fence and bit, the bit bites in and drags everything forward. I made a little graphic below to show the issue. The bit rotates counter-clockwise. Keep out of the red zone and use the green side. I recovered by starting over and moving on to a new piece of wood. This time without any issues. Once I got the groove completed I tapered the back a little. It doesn’t need to be 3/4″ thick all the way across, so I thinned the back end down. I like the effect a lot, but in retrospect I could have gotten a lot more aggressive. With the tapering done I used the green printed part as a template to lay out the two curved cutouts of this part. I made the center cut wide enough to help lighten the look, and provide a cutout around the speaker ports at the bottom edge of the iPad. I was able to orient the front to show off some lovely rays (little speckles in right hand picture) in the maple. I am really happy with this, a past version of me would have cut the groove and called it good. The block would have been functional, but chunky and brutal. This is lighter and more elegant. Truth be told I could have done more lightening and still had a functional part, but as always it is a learning-by-doing experience. A spray coat of lacquer sealed the deal. Two hobbies collide as I print something super nifty for my wood habits. 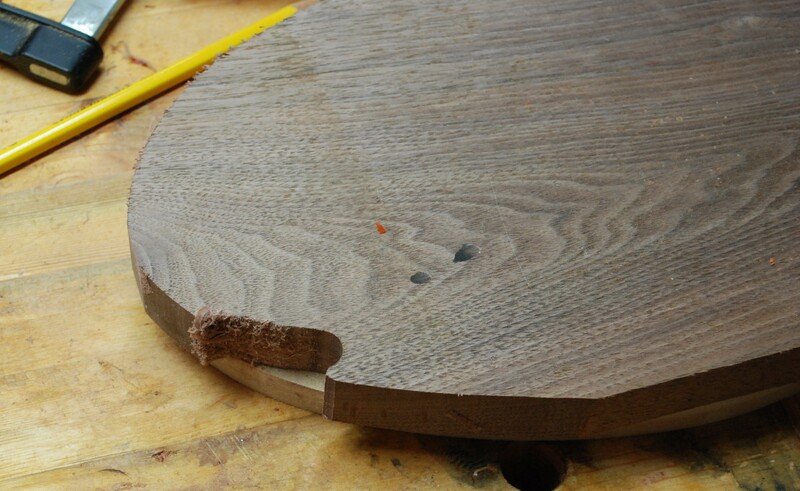 A cool thing you can do with router tables is apply a template onto wood, and use a templating bit to match cut. The bit has a bearing of the same diameter as the cutting edges. It rides against your template and cuts away any underlying wood that isn’t shaped like your template. Super handy, but you need a good template to start with. Enter the 3D printer. I modeled up this little jig so that it hooks onto the edges of a board and gives an exact radius. It is hard to see given the color, but I printed a 1″ text in the bottom to note the size of the radius. Here is a picture of the jig fully seated, and what the resulting cut looks like. Very clean and smooth. The large circular cutout gives a lot of finger purchase so you can hold it tight and far away from the spinning bit. One concern I had was with the material. Would the cutting friction heat up enough to melt the plastic. I did 4 cuts on a 3/4″ bit of plywood and everything looked good. If I had a hundred corners to do, I would worry. I could always upgrade to PETG. My latest round of cheese boards appeared very successful, but it wasn’t all perfect. I bought a few cutting board templates from woodcraft and was some fun board. For example this pepper below would have looked great red padauk. The idea is that you double sticky tape this MDF shape down to a piece of wood. Use a saw to cut away most of the excess, then use a flush trim router bit to match the wood to the template. That was the idea at least, it had issues. Everything was going ok until I got to this thicker area. The bit dug in and shifted the pattern despite all the tape. Ok, no big deal, I just need to go slow, and I can smooth that out on the sander. Nope. It caught again on the other side and split off a big hunk of the board. This one can’t be salvaged any more. Things didn’t go well with the padauk, but it some odd grain in places and that shape had tight turns. I decided to try a simpler fish design in walnut. There were no tight spots or harsh curves, so I figured this would work better. Plus I did a good job getting everything really close with the bandsaw. That looks good, let’s give it a go. Even with the edges tightly trimmed it still dug in hard and shifted the template. I used a lot of carpet tape, and bought a decent template router bit. No idea what the problem is, but I would issue some caution to anyone wanting to try this for themselves.